Known affectionately as 'The Pitman Poet', Tommy was born in on the 15th August 1848 in Wood Street, Shotley Bridge, County Durham, his father and mother having moved to the area from Haswell . Today the twin rows of stone-built cottages have been demolished, as have the gas works and flour mill which once operated at either end. Shotley Bridge is on the Western fringe of the Durham coalfield, along which small drift mines like those at Whittonstall and Daisy Hill worked. 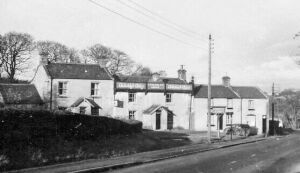 Tommy is known to have lived most of his life at Shotley Bridge, Iveston, East Tanfield, various parts of Tanfield, Tanfield Lea and Tantobie where he died in Havelock Terrace on the 30th August 1920 at the age of 72 years. He spent most of his working life in the collieries at Addison, East Tanfield, Tanfield Moor and Tanfield Lea. 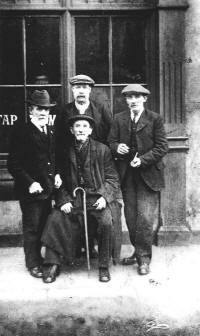 It is known that in 1902, Tommy moved to Whitley Bay where he lived and worked for a period as a Newsagent. Tommy was a short man with bow legs, possibly as a result of rickets and in later life used to walk with the aid of a walking stick. Picture showing Tommy seated c. 1912 outside the Oak Tree Inn, Tantobie. If Tommy did have health problems this may have been an incentive to his song writing career. George Ridley's serious song writing was spurred by necessity and the consequences of a severe industrial accident. Such accidents were not uncommon, and for working men in the North, the popular culture of singing, entertaining and writing verse offered the possibility of a small, but alternative income. Tommy's life spanned this heyday of the great coalfield, known as the Great Northern Coalfield, when over 2000 miners were subject to horrendous conditions at work and at home and strikes and lock-outs were not uncommon. ;families, many of his works were humourous. His songs were sold as broadsheets, printed and distributed by local printers also funeral directors bought verses for their cards. This was one of the ways in which Tommy Armstrong came to earn a living and helped those in need, especially the bereaved and injured following disasters. What put Tommy on the way to recognition was the presence of a vibrant popular culture in the Stanley area. In his book, ‘The Story of West Stanley’, Fred Wade makes reference to an Annfield Plain Soiree. These were occasions when much effort was made by holding teas, concerts and balls to raise money for Reading Rooms, etc. Tommy was closely interested in this Annfield Plain concert in 1864 which included the artistes Mr McMillan, a popular comic and Joe Wilson who was making his name as a singer of Tyneside songs. Soon after Tommy wrote his first song about himself, 'The Borth of the Lad'. From this time on it would seem that Tommy Armstrong was set to become the "pitman's poet" and if this was made possible by the popular culture of the area, it was the mines and the mining industry which provided the inevitable and unrelenting background to his life and songs. In 1821 the Hetton company sank the first shaft through the limestone on the concealed coalfield in the East of County Durham. With coal drawn from the Hetton Lyons Blossom pit, the area was set for a substantial expansion in coal production. The dependence upon the London market for house coal eased as other coal-using industries such as iron and steel and the shipyards expanded. In the eighteen thirties and forties new pits were sunk in rapid succession in the East and the West of the county. Monkwearmouth, Seaham, Murton, Thornley, Haswell, Wingate, Esh Winning and Roddymoor.collieries were all sunk at this time. 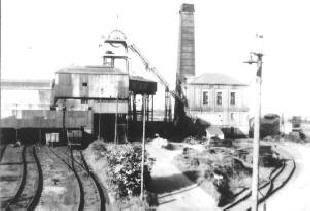 In the Stanley district Burns' colliery was sunk in 1832 and the Air pit in 1849. Tanfield colliery itself was opened in this period. So rapid and extensive was this development that in 1850 a correspondent for the Times newspaper described County Durham as little more than one huge colliery". In 1869, when Armstrong would have been twenty-one, there were 157 collieries and drifts operating in the coalfield. Stanley itself was ringed with collieries owned by the Lambtons and the Joiceys, John Bowes and Partners and the new joint stock companies like Holmside and South Moor and the South Medomsley Colliery Company. Stanley was like the Klondyke - a place dominated by the mining of black gold. In the last thirty years of the nineteenth century it expanded enormously, transforming a rural area into a major urban complex. 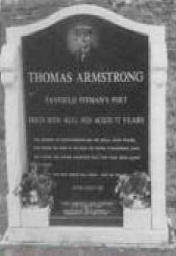 For Tommy Armstrong there were two Stanley’s, first there was the business street, with theatres, picture halls, shops, churches and pubs and second the industrial base upon which all this rested as well as the harsh conditions of its workers - the miners - and their families. At the East end of the Louisa Terrace in Stanley a railway line crossed the road to serve the Oakey's Colliery screens and siding, which were behind a high wooden fence about sixty yards long. There were three drab grey stone houses and another fence of thirty yards, behind which was an airshaft for the Louisa Pit. On the opposite side of the road beginning at the rail crossing was a high brick wall with coal hoppers inset, to provide for the delivery of workmen’s free coal, and the lofty brick buildings of South Moor Colliery County Workshops. These buildings enclosed the Louisa Old and new pit shafts, railway sidings and screens. The latter also catered for the Hedley and William pits of Old South Moor, their coals reaching the screens by way of the Hedley gangway with the use of endless rope haulage. In this time of great industrial change rural traditions were maintained. Men kept pigs and a range of other livestock. Women cooked all manner of food, and also cleaned and sewed and washed. 'Market Day’ remained an important day in the weekly routine. Something of this life is captured by Tommy Armstrong in songs like ‘Stanla Market’ (with the opening line if you're bad and off your meat) and ‘Cat Pie’ and ‘Hedgehog Pie’, while a side of community relations which are far from idyllic is developed memorably in the Row in the Gutter. Daily life, and its goings on, form the focus of these songs. Others examine daily life in the pit, and here the gaiety and mischief has a strong acerbic edge. ‘Oakey's Keeker’ is a case in point. The "keeker" in the Durham mines was the man in charge of the surface of the colliery, Here was the place where the coal, hewed with such effort and drawn off the coal face in tubs, was measured and weighed. The miners were paid by the weight of coal in their tubs and if there was too high a proportion of stone payment was reduced. So important was the weighing on the surface that miners had their own "check weighman" to check the master's weights. In all this, of course, the “keeker” was a central figure. A bad “keeker” could make a considerable difference in the weekly wage packet. And at Oakey's Colliery in the 1870's the miners had to endure such a man. 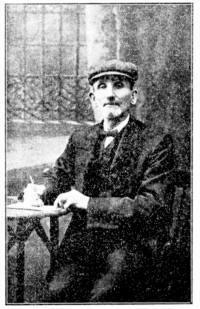 Joseph Elliot was transferred to the pit from the nearby Bank foot Colliery In Anfield Plain. In Durham, people's biographies are followed closely and it was known that Elliott was born into a family in Maiden Law. To the people of Stanley he was known as "Maiden Law Joe", and this is how he is referred to by Armstrong who said in his poem, “For he has no feeling for men that’s below; this hairy-faced rascal Old Maiden Law Joe". It was this description which moved the “keeker” to try to take Tommy Armstrong to court for libel. The Consett Guardian dated 1st March 1878 gives a report of Joseph Elliott presenting the offending work to the Clerk of the Court and the Magistrates at Lanchester Petty Sessions. It was noted that Tommy Armstrong has called Elliott, ‘hairy faced rascal’. During the hearing, there was much laughter in the Court and there is no doubt that the Chairman (Mr Kearney) and the Clerk (Mr Watson) ridiculed Joseph Elliott throughout. At the end, Elliott said, “This is the first time I have come before you and I’m very sorry. I am very much offended to come here and be laughed at.” He then left the Court. These verses, incidentally, elaborated the insult, suggesting that Oakey's “keeker” was certainly bound for hell. This story makes clear the way in which these poems linked directly into life and politics. The popularity of these verses made them important political weapons in a society where "the masters" anticipated respect as part of their due. 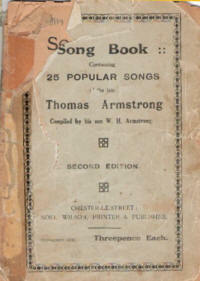 This aspect of Tommy Armstrong's writings was developed in other directions as well. Tommy made up his songs, had them cheaply printed, and distributed and sold as broadsheets at a penny each for charitable causes, so too were his letters and other pieces of prose. Miners were then paid fortnightly and had to go to the Overman's house or office where he would tell them what their pay was to draw on the following night. Obviously the poor coal miner could quite literally be robbed by unscrupulous management. There was no appeal system to challenge these deductions. Fines and off-takes were but one part of the lines of potential conflict which divided the masters and their miners on the coalfield. The Colliery Houses were owned by the coal owners and their up- keep was a constant cause of concern. The houses were slums and the miners had no other choice but to live in them, unfortunately the threat of eviction was used by the coal owners as a great deterrent. In times of strike, miners and their families were evicted from these homes, This is the theme of both Oakey's Strike, written in the Black Horse public house at Red Row, Beamish and the South Medomsley Strike. Oakey's Strike is notable for the fact that it was the theme chosen for a 'bardic duel' between Tommy and William McGuire, a newcomer to the district. The contest took place in the Black Horse pub. A few miles away the men of Oakley Colliery were on strike. The owners decided to evict strikers and they scoured the slums for layabouts to move the pitmen's furniture out into the streets. The 'Oakey evictions' was chosen as the theme for the duel. McGuire's song is forgotten but Armstrong's lives on. The last two decades of the 19th century were Armstrong's most prolific years and the strike songs reflect the high feelings of the period when the Miner's Federation was growing rapidly. The words of the songs are not revolutionary and concentrate on bread-and-butter issues. As they were sung to raise money for strikers' families, some tact was required so as not to alienate the sympathy of donors. The aim of Tommy’s song ‘The South Medomsley Strike’ (held in many folk circles as the greatest mining song ever written), was to put the record straight. The song identified the masters, and lambasted the Candymen who, with the aid of the local down-and- outs, ejected the miners and their families from their homes. This was a powerful song in which colliery managers and owners are described as tyrants and their accomplices threatened with boiling or hanging. It is for those Candymen that Armstrong's most severe wrath is reserved. These men who were local scrap metal dealers earned their name through their practice of giving sweets to children in return for rags. In the North, their reputation after strikes was lower than that of the blacklegs. The songs were written at a critical time for the Durham miners. Throughout the nineteenth century the miners had struggled to form a trade union. In the 1830's and the 1840's unionism was defeated and union activists like Hepburn and Jude blacklisted. In the 1850's and 1860's isolated miners like Ramshaw and Rymer continued in their attempts to build a trade union amongst miners in Durham. In 1869 the Durham Miners Association was formed and this was recognised by the masters in 1871. With the recognition of the union went the removal of the bond, but not the removal of conflict and injustice. The strikes in the 1870's were critical ones which emphasised this fact. The biggest strike, however, took place in 1892 when the whole of the Durham coalfield was locked out. In this strike (which took place in the middle of a period when miners were attempting to form a base for national unity) the Durham miners were alone. Although they received help from collections, notably from Northumberland, coal continued to be produced in Yorkshire and elsewhere. The Durham miners were eventually defeated. At that time Tommy Armstrong was 44 and at the height of his reputation as a song writer. Be a father to the orphan, never let them cry for bread. The Times Newspaper reported that on Saturday 26 August 1911, the Consett Co-operative Choir of 33 members was on its way to Prudhoe to take part in an annual choral competition. 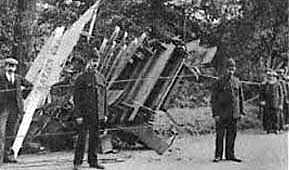 The party was travelling down Long Close Bank, Medomsley in a motor charabanc when its brakes failed and it crashed into a tree. Nine of the choir were killed instantly, a tenth died shortly afterwards and many others were injured. Members of the Burnopfield Ambulance Brigade, who had been attending their annual flower show and sports day in Thompson's field at Bryan's Leap, got into the shafts of their horse-drawn ambulance and manhandled it to Medomsley Bank while someone fetched a horse. The Pitman’s Poet Tommy Armstrong paid tribute to the dead and injured in the following poem. He didn’t write his commemorative poems to make money, he genuinely felt that he had an obligation to pay tribute in verse. Scripture tells us very plain to "Think not of to-morrow,"
Because our happiness and joys may quickly turn to sorrow. Where Death has called away young men and women in their prime. And others, in the best of health, were suddenly called away. I'm not prepared to go just yet, call back some future day. The Rich would live, and Death would only call upon the poor. Look at the sad calamity - going to Prudhoe Show. To join a Singing Competition which was held that day. The weather was both fine and fair, and pleasant for a drive. But little thought that afternoon that some of them would die. That not a one amongst the lot would see the Prudhoe Show. They moved away, but never thought of danger, or the troubles they would meet. The danger that their lives were in not one of them did know. The vehicle and its passengers ran smash into a tree. With stimulants and bandages to dress up each one's wound. On going to the Infirmary, he died upon the way. Where all is Happiness, and Peace, and Everlasting Love. Never a rich man, Tommy suffered more and more from want in his declining years. Concert parties and entertainments were arranged to assist him, little enough for a man who had kept Stanley laughing for fifty years. He died penniless in Havelock Terrace, Tantobie on 30th August 1920 at the age of seventy-two. For every man who reads will know that we are not to blame. This headstone, replacing the original, was unveiled on 9th August 1986 by Arthur Scargill, President of the National Union of Mineworkers. 1. ‘Polisses & Candymen’ Edited by Ross Forbes Published by The Tommy Armstrong Memorial Trust. 2. Article by the Sunniside Local History Society. 3. Book entitled “Tommy Armstrong: The Pitman Poet” by Ray Tilly.